In this second part of the tutorial series, you’ll aim for developing a fully playable version of the game. When you’re finished, the user will be able to drag the tiles and drop them on the correct targets, where they will “stick” to the spot. 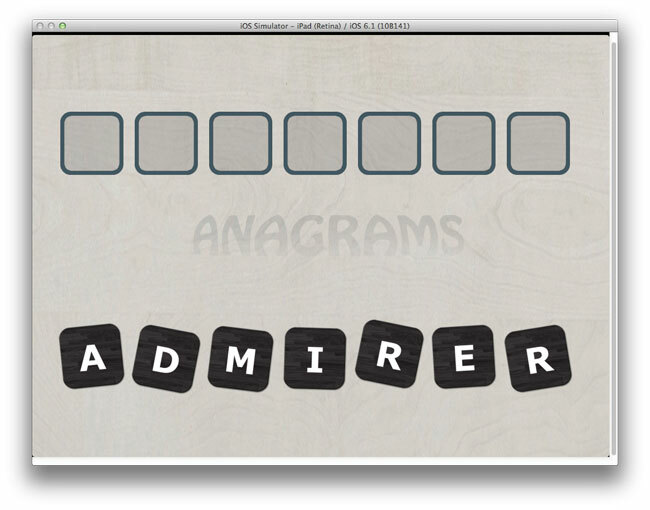 Welcome back to our 3-part tutorial series that shows you how to make a letter / word game with UIKit – in this case, a game of anagrams! If you successfully followed through the first part of this series, you should now have your game board showing up onscreen. So far, you’ve learned how to kick-start your UIKit game, how to plan your controllers and how to connect your views, and have also started implementing the game elements. Now you’ll take on the gameplay itself and grant the user some special powers, like dragging the tiles around and dropping them onto the targets at the top of the screen. 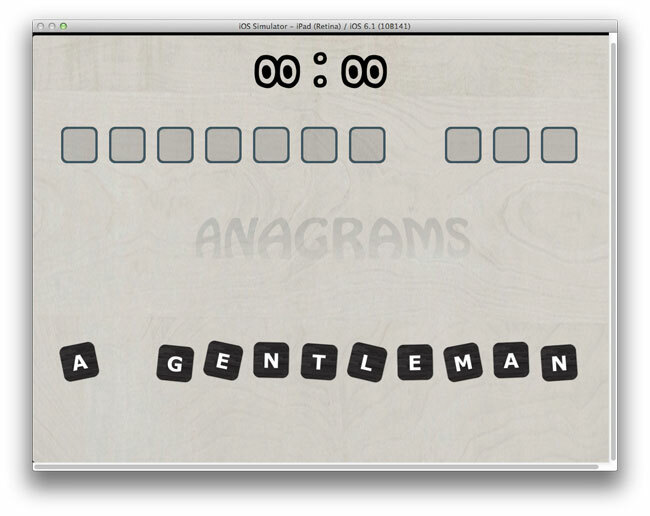 A heads-up-display with a timer and score ticker will keep the player’s ego in check. Time to grab your UIKit and get back to work! In this second part of the tutorial series, you’ll aim for developing a fully playable version of the game. When you’re finished, the user will be able to drag the tiles and drop them on the correct targets, where they will “stick” to the spot. When all tiles have been placed on the correct targets, the player will win that puzzle. There will also be a timer – the player will have a limited amount of time to finish each puzzle – and a score display that will increase and decrease in real time, according to the player’s actions. Make the tiles notify the game controller when they are dropped somewhere. Implement handling of tile drops in the game controller. Check if the player has won after each successful tile placement. Create a separate view layer to contain elements like score readouts and menus. It’s usually best to keep these arranged in their own view, rather than including them in the same view as the actual gameplay elements. Add a level timer and a player score. This is a game, after all! All right! You’ve been debriefed. Now back to the code! You might already be familiar with how to handle touch events with UIKit. If you are, there’s nothing different about handling touches in a UIKit game. You just need to implement the touch delegate methods in TileView. Before your tiles can receive touch events, however, you need to enable them. This instructs iOS to send this object events when a touch occurs within the object’s bounds. By default, this is set to NO for a UIImageView (which this class derives from), so you have to set it to YES manually. When the user touches down on a tile, figure out the offset within the tile of where their finger lies. When the user drags, you’ll set the center of the tile to the new position of their finger – except you’ll shift the tile by the offset you computer earlier to account where within the tile the user’s finger is. You’ll use _xOffset and _yOffset to keep track of the distance between the center of the tile and the initial placement of the user’s finger when the touch began. When a touch is detected, you fetch its location within the tile’s superview (that is, the view that contains the tile). You calculate and store the distance from the touch to the tile’s center. When the player moves their finger, you move the tile to that location, but you adjust the location by the offsets you stored in _xOffset and _yOffset. This keeps the tile from centering itself under the player’s finger as soon as they start moving it – you want it to feel like the user’s dragging a particular point within the tile. When the player lifts their finger, you make one last call to touchesMoved:withEvent: to make sure the tile’s position is set to the touch’s final location. You could have just typed the same code here as in touchesMoved:withEvent:, but it’s better to avoid repeating code where possible to make maintenance easier. All right! Build and run the project and have fun playing around with the game tiles. Cool – you’re already one step closer to your goal. Hey, Game Controller! A Tile Is Dropping! In order to make the game controller accept notifications from tiles when they are dropped somewhere on the board, you’ll make the game controller a delegate to all tiles. 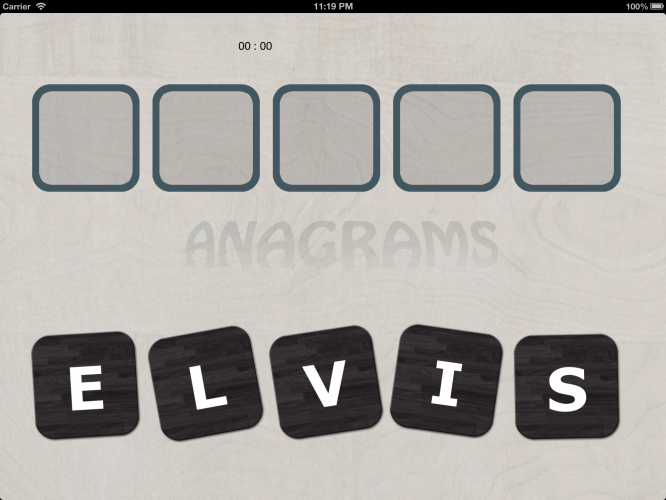 The tiles will then invoke a method on their delegate when the player drops them. Therefore, get ready to get some experience with the delegation pattern! You always need to do this when you declare the class’s delegate protocol in the interface file. You need to pre-define the class so you can use the class name in the protocol, and afterwards you can create the class interface. TileDragDelegateProtocol requires one method – the one that handles a finished drag and drop operation. Totally easy, right? 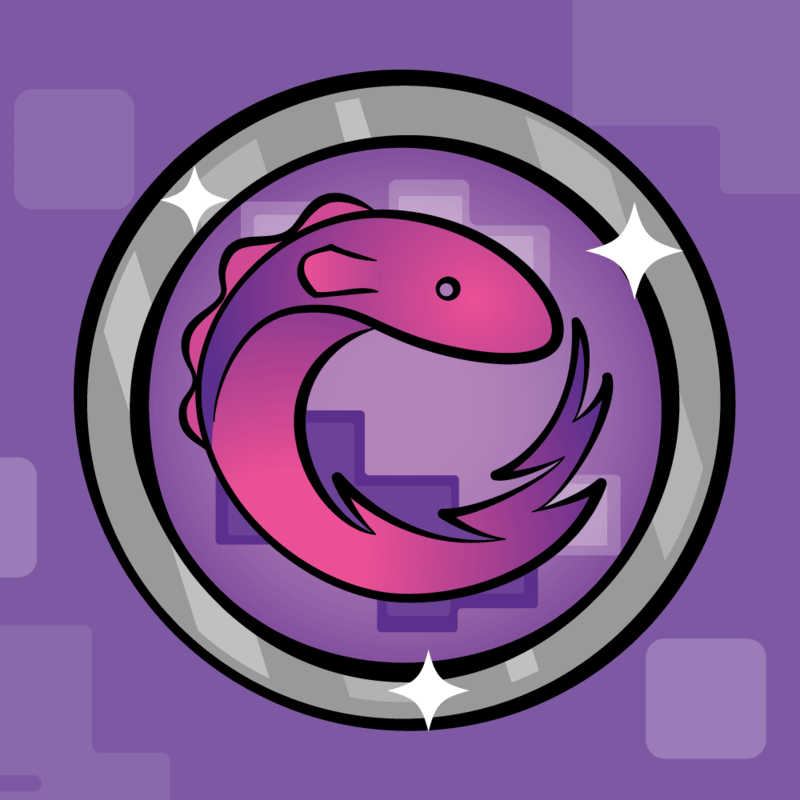 You check whether the dragDelegate property is set, and if so, you just call the delegate’s tileView:didDragPoint: method, passing it self and self.center. Now you need to make GameController conform to your new protocol and actually do something with this information. This code loops over all objects in _targets and, for each of the target views, checks if the given drag point is within the target’s frame. Ha! The simple if statement effectively checks if the tile’s center point was dropped within the target – that is, whether the tile was dropped on a target. And because the point passed to this method is the tile’s center, the method will not succeed if only a small portion of the tile is within the target. If a tile is found to be within a target, the matching target is saved to targetView. 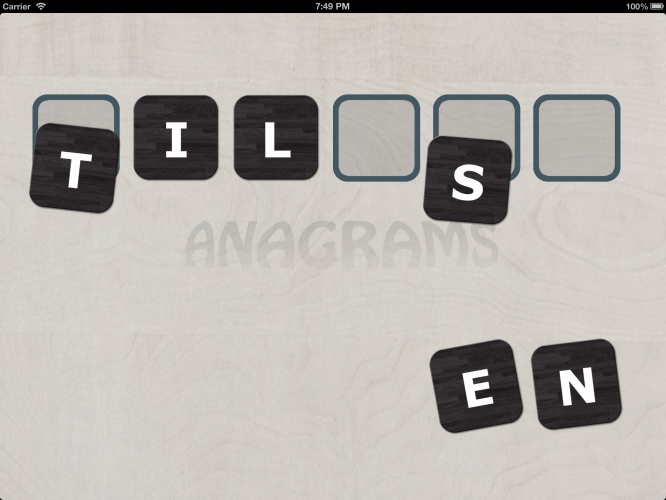 Compare the tile’s letter with the target’s letter to see if they match. 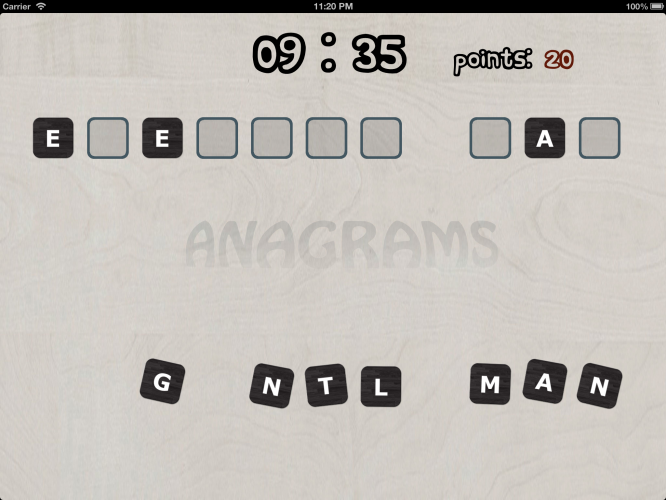 If the letters do match, you will do various bits of processing. For now, you just print some messages to the console. If the letters do not match, you want to indicate that to the user. Again, for now just use a log statement until you’ve verified that the logic is working correctly. OK, build and run the project and try dragging some tiles onto targets. If everything went well, there shouldn’t be any difference compared to what you saw last time you ran the project. But why no print statements? That’s a good question! Can you figure out why the tiles don’t react to being dropped on the targets? Run the project again and you will see your success/failure statements printed to the console when you drag a tile onto a target. Now that you know the right things are happening at the right times, you can make it do something more fun than printing to the console! You set the isMatched property on both the targetView and tileView. This will help you later when you check to see if the user has completed the phrase. Disable user interactions for this tile. The user will not be able to move a tile once it’s been successfully placed. Create an animation that will last for 35 hundredths of a second. By passing in UIViewAnimationOptionCurveEaseOut, UIAnimation will automatically calculate an ease-out animation. Rather than making changes in even increments across the given time, it will do larger changes in the beginning and smaller changes toward the end, slowing down the animation. This block defines the changes that should occur during the animation. In this case, you move the tile so its center is on the target’s center, and you set the tile’s transform to CGAffineTransformIdentity. The identity transform is basically no transform. This effectively undoes any changes you’ve made to scale and rotation. In this case, it straightens out the tile. When the animation is complete, you hide targetView. This isn’t absolutely necessary, since targetView will be completely behind tileView. But in general, if you know you have a view object that will not be visible, it’s more efficient to hide it so that its parent view knows it’s safe to skip it for certain types of processing. You randomize the tile to demonstrate to the player that it does not match the target. You create an animation that does some extra offsetting by a random value to the tile center’s x and y positions. Build and run the project. This time, instead of just statements printed to your console, you will see the tiles slide onto the target positions when dropped in the correct place, and sliding away when placed in the wrong place. Cool! The above code loops through the _targets array and checks to see if ANY TargetView is not yet matched. If it finds an unmatched target, then the game is still not over and it bails out of the method. If all the TargetViews are matched, then your log statement “Game Over!” appears in the console. Later, you will do some more interesting things here. 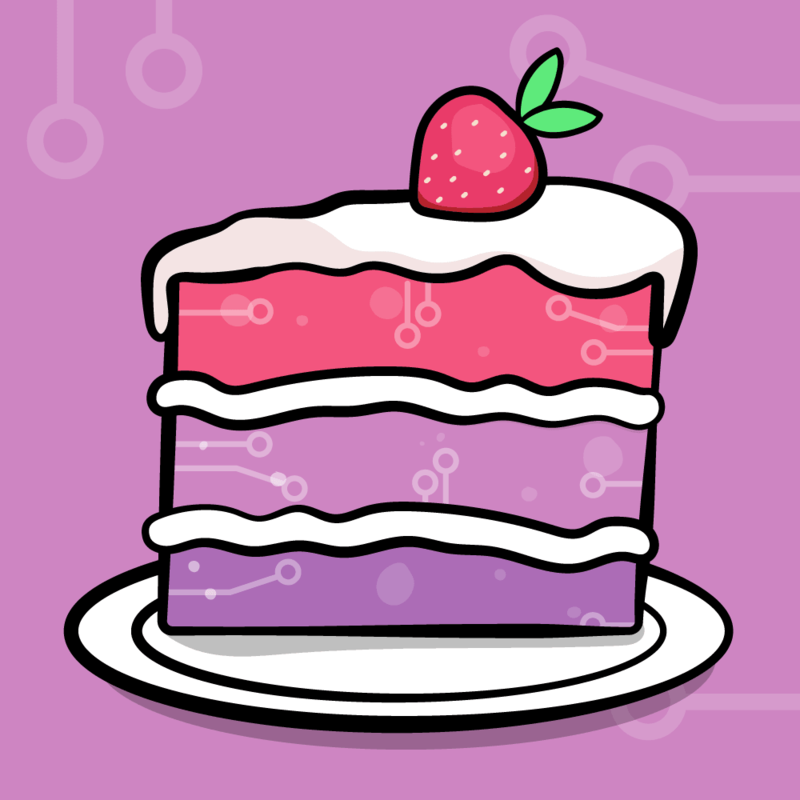 Build and run the app and complete a puzzle. You should see your log statement printed to the console when you are finished. Great! No. The gameView is for all gameplay elements. You generally want to put elements like the score, time readouts and player controls onto their own view layer. This allows you to more easily do many types of things, like hide them when the game is paused, or maintain fixed sizes and locations for these controls while simultaneously zooming in on some area of the game board. This separate layer is often called a heads-up-display, or HUD. It will be easier to test your HUD layer if you have something to display in it, so first you will make a label to display the game timer. Create a new Objective-C class file in Anagrams/Classes/views named StopwatchView, and make it a subclass of UILabel. This will be a simple custom label that displays the remaining time in the format “[minutes]:[seconds]”. The above code isn’t fancy. It just sets the label’s text property to the mm:ss format. This just makes the label’s background transparent. You will add more here later. Now that you have a label to display, you need a HUD layer to hold it. 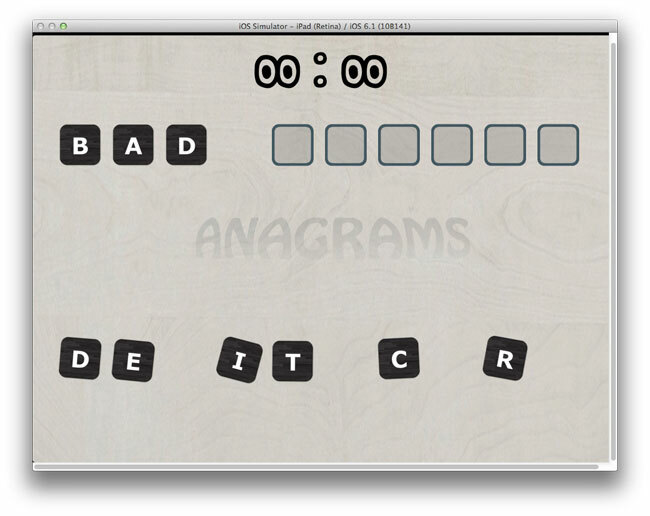 Create a new file in Anagrams/Classes/views for an Objective-C class named HUDView that subclasses UIView. For now, you’ll have a single property that holds a timer, as well as a custom convenience factory method that you’re about to implement. The factory method creates a new HUDView and initializes its stopwatch property with a new StopwatchView with 0 seconds remaining. Now you have a reference to the timer view in the stopwatch property and can go about implementing the logic behind it. But first, get that timer on the screen! You haven’t checked your progress in a while. You create a new HUD layer view as big as the screen and you add it to the view controller’s view. Then you also assign it to the game controller’s hud property. OK, build and run again and have a look at your new HUD layer! Um, that stinks. Before you move on with the functionality, now is probably a good time to talk about…. The fact you are using UIKit to create a game does not mean that you also have to use vanilla UIKit components. To make a game more “game-like”, you will want to use fonts, buttons and other controls that look like they belong in a game and not in a spreadsheet program. If you think the first font rendered above is more exciting, in a game context at least, perhaps you should hire a graphic designer. :] Long story short, choose an appropriate font for your game. You’re not likely to excite players with a game menu rendered in Arial or Verdana. Note: Then why did you go for good old Verdana when you created the tile view? On tiles, it makes sense to have maximum readability. Players shouldn’t get confused about which letters they’re seeing. The answer is convenience. Imagine your graphic designer finds a much cooler font for your game. If you already have font assignments sprinkled all over the game code, replacing them will be a pain. What’s more, abstracting the font size is a very good idea. That’s why you have two definitions – one for a big font and one for normal-sized font. This makes it a lot easier to change the font size in all HUDs throughout your game with a single line change. This sets the label’s font to kFontHUDBig, which you just defined in config.h. Build and run again to behold your new, game-ready label! Well… actually, that’s fine. It’s all because of how you normally have layers ordered in a game setup. 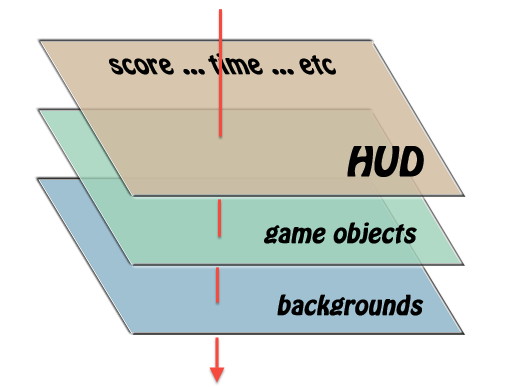 As illustrated in the schema below, you will always have the game controls, score, time, etc. on top, so that they are always visible. 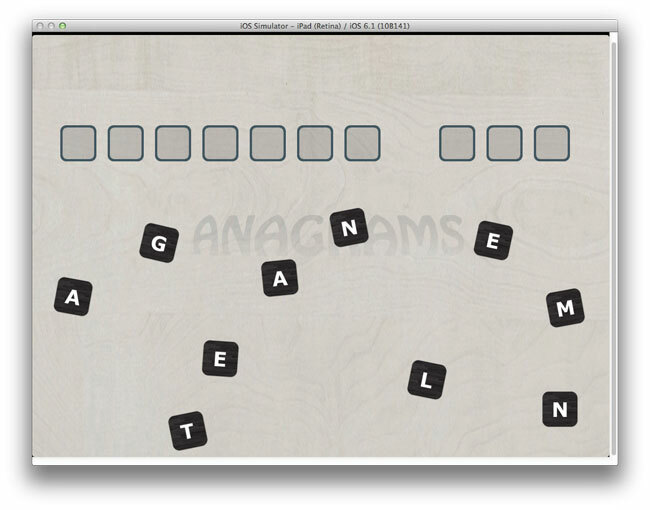 Under the controls you will have all the objects that move – heroes, word tiles, and so on. And usually at the very back you will have the background – whether static or parallax, it does not matter. You have exactly the same setup so far, and since the HUD layer is on top of everything, it swallows all touches. Fear not! You can easily turn off the user’s interaction with the HUD layer, thus allowing the user to touch the tiles in the underlying game objects layer. Build and run the game again, and you’ll see that you can have your timer and drag tiles, too! Sweet victory! Implementing the game timer is incredibly simple. Remember that you already load the total game time in seconds from the level config file. You haven’t used this data yet, but now you will. _secondsLeft will store the number of seconds left to complete the level. It will be decreased every second by _timer. 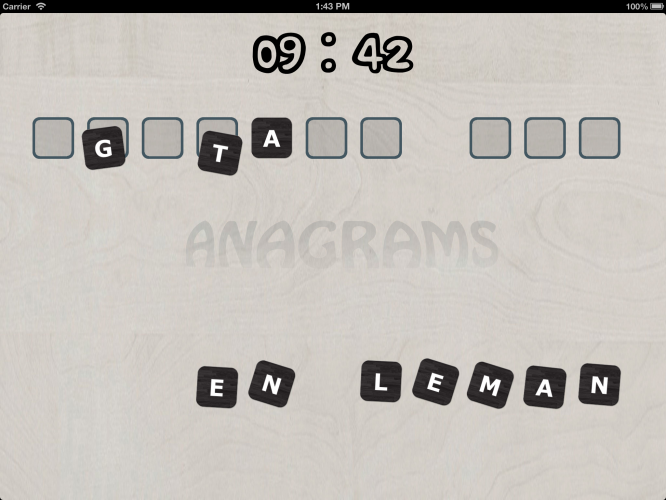 One to start the timer when the tiles are displayed on the board. 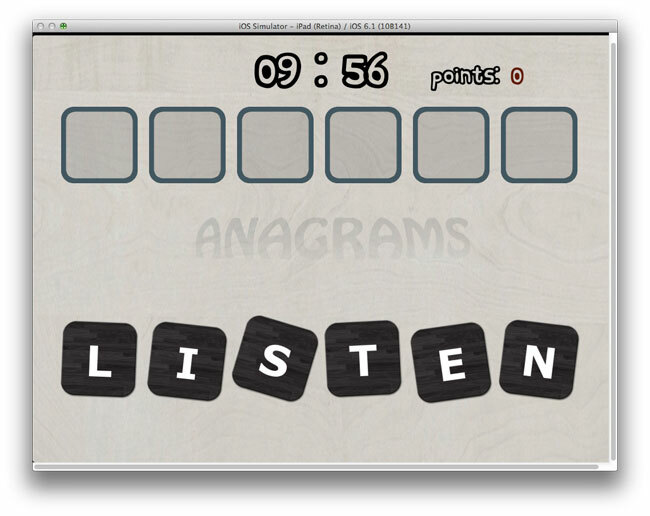 One to stop the timer in case the player solves the puzzle or the time is up. One to fire each second and update the HUD. You initialize _secondsLeft with the initial remaining time stored in the level, and update the stopwatch label to display this time. You also schedule a new NSTimer that will invoke tick: each second (you haven’t added this method yet). Calling invalidate on the timer stops it, and then you set it to nil because it is no longer needed. Now define tick:, which will be called once a second while _timer is running. It does nothing more than decrease the amount of seconds left by one, then update the stopwatch label with the new value. If the number of seconds remaining hits 0, it calls stopStopwatch. That’s all! Hmm, what else can you add to your fancy new HUD? When making a game you want to have a separate class just to keep the game data for the current player session. This class will store such things as the player’s current score, remaining number of lives and progress through the game. In a more complicated game, you could have this data also sorted per user, which might require a simple database of some sort. For this tutorial, your game will have a simple class to keep the score between games, but not between app restarts. The points property will store the player’s current score. A setPoints: method would have been created automatically when the compiler synthesized the points property, but you want a custom version that ensures the value is never negative. You don’t want the player to have fewer than zero points, right? So you pass points and 0 to the MAX macro, which returns the greater value of its two arguments. Thus, if you pass setPoints: a negative number, it will assign 0 to _points. That’s all you need for your simple GameData class. But if your game evolves, this class will also become more complicated. OK, it’s time to decide where in the game the player will receive or lose points. When a tile is dropped on a correct target, award the player with points. When a tile is dropped on a wrong target, subtract some points from the current score. 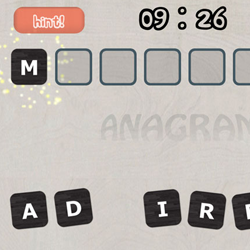 This way, to get the most points possible out of the current anagram, the player will have to solve it without making any mistakes. Challenge: You can also award points upon puzzle completion, and subtract points when the player fails to complete a puzzle in time. How would you implement that yourself? This gives you access to a GameData object to store the score. For now, this just initializes the GameController and assigns a new GameData object to its data property. You will add more here in Part 3 of this tutorial. Luckily the level config file already includes the points per title for every level of difficulty, so all you do here is increment the current score by that number. Here, you do the opposite and subtract points. But there’s no point (ha, ha) in being too tough on the player – if they drop the tile on the wrong target, only half of what they receive for a matching one is subtracted from the current score. All right! Keeping score – check. You might want to add Game Center integration to your game, which will forward the score from GameData to Apple’s Game Center. More on Game Center. You might want to persist the score by saving it to the NSUserDefaults or a keychain. More on secure storage of data with a keychain. If you would like to store the game data to a keychain or persist it to a file, you might find using the JSONModel library super useful. It allows you to convert your model data to a JSON string, which is easily storable in a keychain or a text file. Games are all about achievements and score, so there’s no sense in keeping the player’s score behind the scenes. You need to put it upfront, right on the HUD layer. It will be a bit boring, though, if the score label were to instantly update from, say, 500 to 750. It’s a lot more fun to have the score label rapidly cycle through 500, 501, 502, etc all the way up to 700 – it just a little polish to provide an awesome game experience. value is a property that will hold the score currently shown on the label. labelWithFont:frame:andValue: is a class method that will return a new CounterLabelView initialized with the given frame, font and value. countTo:withDuration: will animate the label’s text, counting up or down to/from the current value to the one provided. The animation will have the given duration in seconds. Basically, each delta time (in seconds), you’ll increment (or decrement) the label one point, until you reach endValue. In the above code, you create a new instance of CounterLabelView with the given frame, then you set its background to transparent and its font and value properties to the given font and value. You update the self.value property by the valueDelta that was passed to the method, which will be either 1 or -1. You check whether you are counting up or down, and then perform the appropriate check to see if you've reached the final value. If counting up, you check to see if the current value is greater than endValue; if counting down, you check to see if it is less than endValue. If you reach the final value, you just bail out of the method. If you reach this stage, it means the endValue was not yet reached. Here you schedule another execution of this same method after delta seconds. updateValueBy: will keep calling itself and updating the label's text until it reaches the value stored in endValue. This method is the most complicated one you've added thus far, so let's go over it carefully. You find how many values the label needs to count through by calling abs(to-self.value). For example, if the current score is 50 and you want it to go to 65, you'll get the value 15. If the current value is 65 and you want to go to 50, you'll get the same value of 15. You add 1 to the above value just in case it turned out to be zero. You do this because in the next step you'll be dividing by this value, and dividing by zero is a no-no. You divide the total time for the animation, t, by the number of values you need to count through. This gives you a value for delta. Finally, if delta is less than 0.05 seconds, you increase it to 0.05. 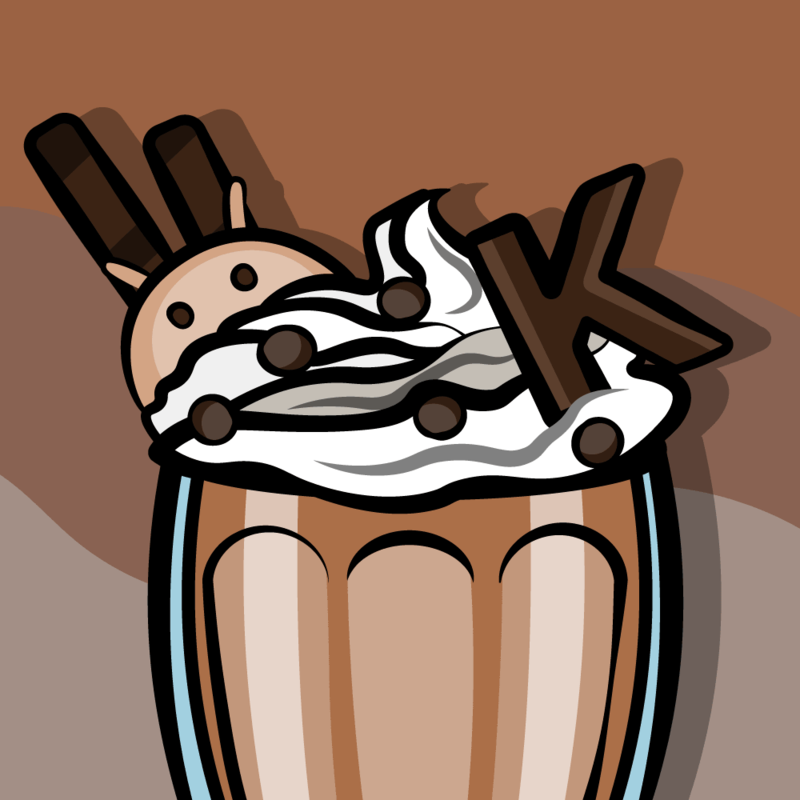 This just keeps the animation from moving too quickly, which wouldn't look as nice. You set the endValue you are counting towards. You cancel any scheduled operations for the class, because you will schedule some others in a moment and don't want them overlapping. Finally, you have an if statement that calls updateValueBy:, passing either 1 or -1 and thus counting either up or down, depending on the current label value and the end value. Nice – and you're just about done! This property will store the HUD's CounterLabelView. This code looks a bit longer than you might expect, but it's nothing fancy. You create one label that reads "Points:", using the same font you used for the timer (but the smaller size this time). 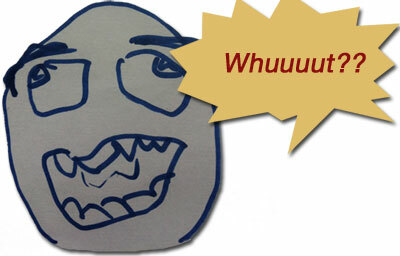 Then you create one CounterLabelView label with an initial value of 0. If you try playing, you'll find that the score is not updated, ever. Well, that's a bit boring and anticlimactic, after all your work! Luckily, it's easy to fix. This will make the score label count up to the just-updated score value, and it'll do that in about 1.5 seconds. This updates the label, but does it in about .75 seconds. Since the penalty values are half the success values, making the duration half as much will make the counter appear to change values at the same pace, whether it's going up or down. Oh, sweet joy! The score label counts up and down as you drop tiles on the targets. Your game is really coming together! You can download all of the source code up to this point by clicking this link. Woot, your game is starting to take its final shape and is almost fully-playable. You've done well to make it this far. If you think you've progressed a lot in this part of the tutorial, just wait for Part 3, where you'll add even more cool effects and interactivity, including those promised explosions! While you're waiting, let us know how it's going for you so far in the forums.